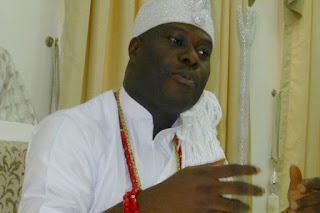 About four decades ago… in the ancient city of Ile-Ife , The Ooni of Ife, the Arole Oduduwa and the Paramount Head of all the Yoruba people worldwide, Ooni Ogunwusi was born into the Giesi Ruling House, Ojaja Royal Compound of Agbedegbede in Ile-Ife the Cradle of the Yoruba worldwide. He was named… Adeyeye Babatunde Enitan . Ooni Ogunwusi was quietly delivered into the humble family of Prince Ropo and Late Mrs. Margret Wuraola Ogunwusi (of Soji Opa family compound, Ile-Ife). Though born quietly, Ooni Ogunwusi’s excellence and outstanding acumen recently announced itself for the world to behold as he was crowned the 51st Ooni of Ife on the 7th of December 2015. Many years before the birth of the young prince, it was predicted that a child of prominence that would impact the lives of mankind would be born into the family at exactly 1pm. Indeed, Adeyeye came into this world at exactly 1pm on a Thursday, the 17th of October, 1974. With the news of the arrival of a new born prince, he was specifically named Adeyeye by his grandfather Pa. Joseph Olagbaju Adewole Ogunwusi Jnr. The name Adeyeye in English translates to ‘A Crown Befitting for a King’; Pa Ogunwusi on setting his eyes on the new born prince began to call him Adeyeye Ooni from that very day till he passed away. Ooni Adeyeye Enitan Ogunwusi is the 5th direct descendant of the Giesi Ruling Family (Ooni Ojaja Orarigba) – Ayikitininu Aran reigned form 1878-1880, he was the 44th Ooni of Ile-Ife to rule. He begat Adegosan Adewole Ogunwusi, who was an extremely powerful prince in Ile-Ife and a war veteran that never lost any battle for Ile-Ife and the Yoruba race.He begat Pa Joseph Olagbaju Adewole Ogunwusi (Jnr. ), a very bold prince who took after his father. He begat Prince John Oluropo Ogunwusi, a radio and television anchor and star presenter that spanned the entire mid-1980s to early 21st century in the South-Western part of Nigeria. He begat Ooni Adeyeye Ogunwusi. Before his emergence as the Ooni, being an astute entrepreneur, driven by turning “impossibilities to possibilities”, Ooni Ogunwusi’s Power of Imagination has set him aside, revolutionizing the approach to creativity and innovation. He is a distinct achiever with the conscience of youthful excellence . His ambition is exceptional with savvy business ideas, above all services to mankind and relentless contribution to humanity is what he is so passionate about and he has gone for it to the fullest, since his ascension to the throne as OONIRISA. Some of Ooni Ogunwusi’s monumental achievements in the first quarter of 2016 , include commencement of construction work at the multi-billion naira Ife Grand Resort, covering over 1,000 acres of land in Ile-Ife, Southwest Nigeria which engaged over 3,000 youths at the project site and he was appointed Chancellor of the University of Nigeria, Nsukka, by President Mohammadu Buhari , Federal Republic of Nigeria. Ooni Ogunwusi, also empowered over 20,000 widows who are war victims and engaged them in Palace community sanitation with weekly benefits for their upkeeps. This bridge builder and advocate of peace has travelled to many parts of Nigeria, preaching unity and peace among traditional rulers and promoting youth empowerment to reduce crime rate and unemployment in society. Ooni Ogunwusi also engaged the Multi-Million Naira reconstruction of the ancient Palace of the Ooni of Ife known as Ile- Oduduwa. Donated 100 Transformers (250 KVA) to various communities to improve power/electricity supply in Ife land. He has reached out to over 50 countries through their Ambassadors and country representatives in Nigeria, advocating global peace and promoting unity with focus on Africans and the entire black race. A staunch lover of culture and tradition, Ooni Ogunwusi has taken it upon himself to reconstruct and renovate all the heritage spots that have been in existence for thousands of years for the entire world to have a feel in form of pilgrimage and tourism thereby promoting the cultural heritage and natural endowments of Ile-Ife through tourism. He is working with many agricultural research institutes over improved yields in order to encourage the youths to go back to the farmland. He has taken it upon himself to establish the largest cocoa nursery field in Nigeria to commence plantation of improved seedlings as Ife is known to be one of the largest cocoa-producing communities in Nigeria. Ooni Ogunwusi is an outstanding personality, the custodian of Yoruba culture and tradition, an internationally-acknowledged business icon, a man of immense substance, a great achiever and administrator par excellence, the reincarnation of Oduduwa and father of the Yoruba Nation and indeed, the Royal Eagle of our Time. Ooni Ogunwusi is a Director on the Board of Imperial Homes Mortgage Bank Limited, (formerly GTHomes) which is a leading National Mortgage Bank and former subsidiary of one of the biggest banks in Africa; GTBank plc. He is also a Director at Fina Trust Microfinance Bank Limited; one of Nigeria’s foremost Microfinance Banks focusing on SMEs and micro credit facilities. He is the founder and Managing Director of Gran Imperio Group, which is the holding company of his Real Estate and Construction, Manufacturing, Facilities Management, Leisure and Tourism companies in Nigeria. Ki ade pe lori, ki bata pe lese !